In 2005 Safe Studio Project founder Chelsea Lucas took her first yoga class and was immediately hooked. She soon started practicing yoga regularly and began a journey towards healing from an eating disorder and depression. Her commitment to yoga as a healing practice deepened and she enrolled in a teacher training program to help bring the positive mental and physical benefits of yoga to others. Despite the incredible healing it had brought to her life, her dedication to yoga almost ended when she experienced sexual misconduct from a trusted yoga teacher. 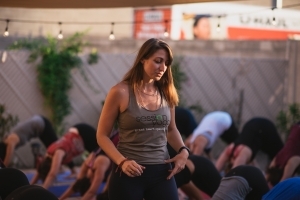 With the support of professionals, friends and family, and her yoga community, Chelsea was able to heal from this experience, and in 2012, she decided to open her own studio, Session Yoga, as a safe space for students. As a studio owner, Chelsea was deeply concerned that there were not enough resources to support studio owners and teachers who were dealing with issues of sexual misconduct. She began to explore what it would look like to provide robust training and support for studio owners and teachers who shared her dedication to offering yoga in a safe space. Inspired by the voices of those who were speaking out in the yoga community, sharing their painful experiences of sexual abuse, Chelsea made a commitment to do more to prevent sexual misconduct. In 2018, Chelsea partnered with Amber Caulkins, a long-time friend and yoga practitioner, to bring the Safe Studio Project to life. 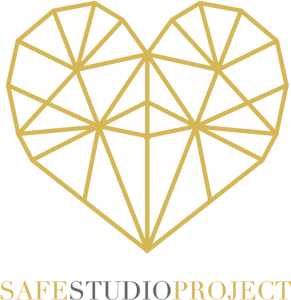 The gold broken heart in the Safe Studio Project logo was inspired by Japanese Kintsugi, the art of using gold to repair broken pottery. In Kintsugi, broken pieces are joined together with gold, turning what was once broken into something stronger and more beautiful. Safe Studio Project is raising awareness about what has been broken through sexual misconduct in our yoga communities and is creating a way for us to join together, heal, and become stronger and more beautiful.